It is no surprise that the radiology industry is facing reimbursement challenges and management difficulties that are forcing practices to analyze the effectiveness and efficiency of their operations. As Bob Dylan sang, “The times, they are a changing,” and drilling deeper into the details of a radiology business has become more important than ever. This article will challenge radiologists to closely analyze their business, holding them accountable for developing a firm plan of action that, if implemented, will strengthen their practice. Without a strategic plan, a radiology practice can still experience some success, but its fate is left more to chance because the practice may not be operating as efficiently or effectively as possible. A radiology practice is a business, but many practices consider strategic planning as something necessary only when expanding the business or dealing with serious threats to its survival. While it is important to consider these matters when planning, there should be other considerations that include looking at the “business” of the radiology practice as a whole. Looking at past performance is valuable, but more important is identifying the processes that are most vital to a practice’s success. By starting with overarching goals, a practice can then dig deeper into business processes in a systematic fashion, which will help identify those areas of most importance to a practice’s success. • Preparation of internal operating statistics: A practice must first analyze and consolidate its data per location, looking at procedure history, charge history, patient collection history, and payer mix history. Because the hospital is a key factor in revenue-based decisions, a practice should also analyze the history of its hospital stipend, if any, as well as radiologist income. • External marketing analysis: Once a practice has drilled into its internal operations, it should also seek overall healthcare trends in its market by looking at top competitors per location, top local employers, major local payers, and local geographic population and income data. • Internal staff surveys: Surveys distributed among staff and then tabulated are ideal for practices that need qualitative information. Asking radiologists what they believe the top three practice goals should be can often align an organization’s communications, and a SWOT analysis can serve to analyze a practice’s strengths, weaknesses, opportunities, and threats. • Strategic retreat planning: This is the start of many important meetings for a practice and involves a presentation that outlines the internal and external data that will serve as the basis for what a practice determines its goals will be. Practice leaders should determine who will participate in this meeting and who will facilitate the meeting, then prepare a meeting agenda. This meeting should be considered an important event where attendees are offered refreshments and meals while they are required to think and work on a firm business plan. • Strategic meeting: The strategic meeting is the event where the plan is rooted for growth; a mission statement and goals should be firmly established with a plan of implementation, including deadlines and accountability among staff members. For the sake of this article, let’s use a hypothetical example for how a practice might implement its plan, starting with one overarching goal to maintain the practice’s current income level and cut costs amidst declining reimbursement, with key steps or smaller goals to achieve the larger objective. 1. Determine who the customer is. Patients are not the only customer or source of income. Any plan for income improvement goes away if the hospital contract goes away, so a group understands that the hospital and the referring physicians are important customers. Understanding who determines success and other key goals can lead to steps to attain them, perhaps conducting a satisfaction survey to gauge where a practice needs improvements in communication with its customer base. 2. Internally market to get outside referrals. A practice sees that it must take ownership of promoting its imaging procedures because it can no longer be choosy in its procedures moving forward. The development of a direct mail campaign or collateral sales materials can help a practice protect its procedure areas within other specialties through educating referring physicians about staff, procedures, and locations. 3. Develop a cost-saving sharing plan. 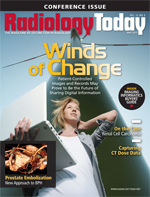 Radiologists can help reduce contrast costs. Projects might include researching contrast agents that they use and whether they are using them appropriately and in the appropriate amounts. Not only can this reduce costs, but the hospital will be appreciative of any cost savings that do not affect quality. 4. Strengthen relationship and position with a practice’s hospital(s). A radiology practice has already taken the standpoint that the hospital is as much a customer as a patient is. Hospital survey projects are an ideal way for hospital administration to measure success. Customer satisfaction surveys impact many other areas of their business, including accreditations and marketing. Once the survey results are in, working with the hospital to identify opportunities for improvement may assist a practice in achieving its overarching goal in this scenario. Turnaround times are also important to the hospital, and working to minimize them can go a long way. By showing good faith and working with the hospital, a practice strengthens its relationship for possible rougher times ahead. While these hypothetical goals are not cookie-cutter to every unique practice, the development and execution of action steps within key goals are designed to achieve the overarching goals of the business. Whatever is determined, there should be a thorough understanding of those areas in the practice that require the most attention and which will have the greatest impact on the business. While mapping out goals and tactics is a substantial starting point, it is not the finish line. A strategic plan needs project deadlines and assigned responsibilities—meaning once the plan is set, the radiology staff must get on the bike and pedal. Working with staff to achieve the tactical portions of goals requires leadership, follow-through, and accountability. The group leader(s) should assign responsibilities and conduct follow-up meetings to ensure they are carried out. Based on the hypothetical goals discussed in this article, a leader physician might assign Dr. Smith to conduct a hospital survey and report the results during the next quarterly meeting, while Dr. Jones may be tasked with researching contrast agents and reporting the results next month. The leader has a responsibility to determine where strengths and weaknesses lie within his or her staff and divvy out tasks to individuals where results will most likely be yielded. Staff may largely handle the actual legwork of these projects, but the radiologists should be involved and accountable. When following through with tasks, all radiologists within a practice must take off the “radiologist hat” and be a doer, business partner, and rainmaker. Many practices may have a commodity mentality, but a plan will only be implemented fully if radiologists begin to think and act more like traditional business owners—making marketing, efficiency, and growth of the business top concerns in achieving sustainability in a declining reimbursement economy.